Earlier today we told you that iH8Sn0w had released Sn0wbreeze v2.9.8 with support for Jailbreaking A4 iOS devices Untethered running the iOS 6.0, 6.0.1 or 6.1 firmware. The reason why Sn0wbreeze does not support A5+ devices like the iPhone 5 is because there is no low-level exploit available. Sn0wbreeze differs from tools like Evasi0n because it creates a custom firmware file that must be restored to your device before it is considered Jailbroken. The reason why someone would want to use Sn0wbreeze over Evasi0n is because it can be used to preserve an iPhone’s baseband version, which is a must for unlockers. Another reason is because Sn0wbreeze allows you to customize your Jailbreak with pre-installed package support and more. Sn0wbreeze v2.9.8 is also the first Jailbreaking tool to support the second generation Apple TV, although iH8Sn0w mentions there is still some glitches. Thus you may want to hold off for the release of Seas0nPass, which tends to be more reliable. Sn0wbreeze v2.9.8 also brings about Hacktivation fixes for the iPhone 4 and iPhone 3GS running iOS 6.x. In this tutorial we will take you through creating a pre-Jailbroken IPSW using Sn0wbreeze v2.9.8. Note: Windows 8 users will need to take advantage of this tutorial from Microsoft to run Sn0wbreeze. Step 1) – The first thing you are going to do is download Sn0wbreeze v2.9.8 from the iJailbreak Downloads Section or from the direct download link below. Step 2) – Once you download Sn0wbreeze v2.9.8 you will need to extract it to your desktop. Step 3) – When Sn0wbreeze is extracted launch it by double clicking the sn0wbreeze-v2.9.8.exe file. Note: You will need to grant Sn0wbreeze administrative privileges. Step 4) – Upon launching Sn0wbreeze for the first time a pop-up window will appear. Read it over, click the OK button and you will be on the screen depicted below. Read through the notes in read and click the blue arrow to continue. Step 5) – Through the next screen you will need to click the browse button and select the iOS 6.0, 6.0.1 or or 6.1 firmware you are trying to Jailbreak. Upon selecting the iOS 6.x firmware Sn0wbreeze will begin identifying the firmware file. When Sn0wbreeze has identified the firmware file you will get a success notification. Click the blue arrow to continue. Step 6) – The next screen you will be presented with 4 options – iFaith Mode, SimpleMode, Expert Mode and Baseband Preservation Mode. iFaith Mode: This mode will allow you to create a custom ipsw containing previously saved SHSH blobs (useful when downgrading). 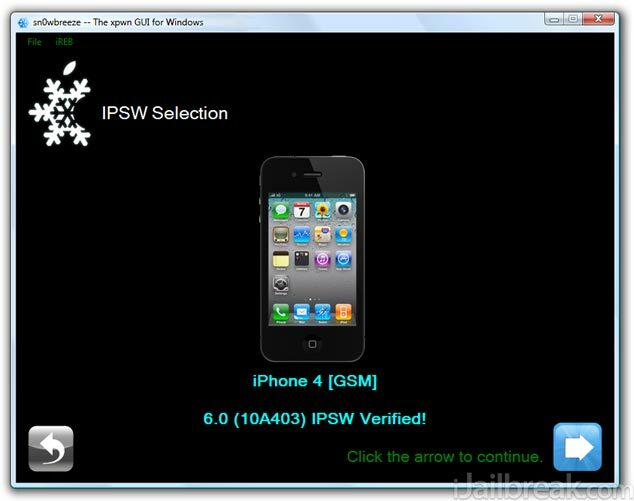 Simple Mode: This mode will begin creating your custom iOS 6.0/6.0.1/6.1 IPSW automatically without selecting any customization options. Expert Mode: This mode will present to you options for customizing your Jailbreak before creating your custom iOS 6.0/6.0.1/6.1 IPSW. Baseband Preservation Mode: This mode is only useful if you wish to upgrade to the latest6.0/6.0.1/6.1 firmware without updating your baseband and without Jailbreaking your iPhone. In this how to guide you will be selecting Expert mode. Click Expert Mode Now. Note: Sn0wbreeze will never update your iPhone’s baseband regardless of which mode you choose. Step 7) – The next screen is where you will begin the customization process. Click the General button to start things off. Step 8) – In the General screen you can select a variety of options to customize your Jailbreak. Enable Battery-Percentage: This option will add a small percentage number next to your battery icon (in the status bar). Activate The iPhone [hacktivate]: This option will activate your iPhone, if you are unlocked. Install SSH: This option will install an SSH service allowing you to view your iDevice’s filesystem. Root Partition Size: This option will change the size allocated to Jailbroken apps. We recommend leaving it as the default size. Select the options you wish to apply to your Jailbreak and then click the blue arrow. Step 9) – The next screen allows you to pre-install 3rd party applications/tweaks. If you wish to do this find the applications/tweaks you are wanting to install and select them. Once you are happy with your selection click the blue arrow to continue. Step 10) – You will now be on the customization homescreen again. 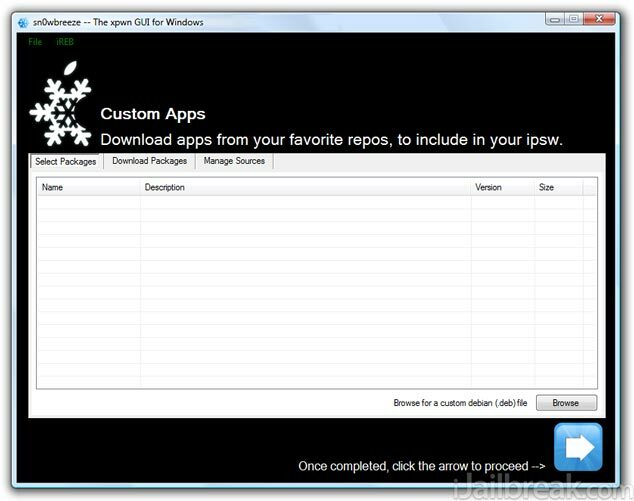 Select the Build IPSW option and click the blue arrow to continue to the IPSW creation process. Step 11) – Sn0wbreeze will now begin creating the custom IPSW with the options you have selected. This process can take anywhere from 5 – 30 minutes depending on thespeed of your computer so be patient. Once your firmware file has been created it will be located on your desktop. Note: Sn0wbreeze has the ability to play PacMan while Sn0wbreeze is creating your custom IPSW. 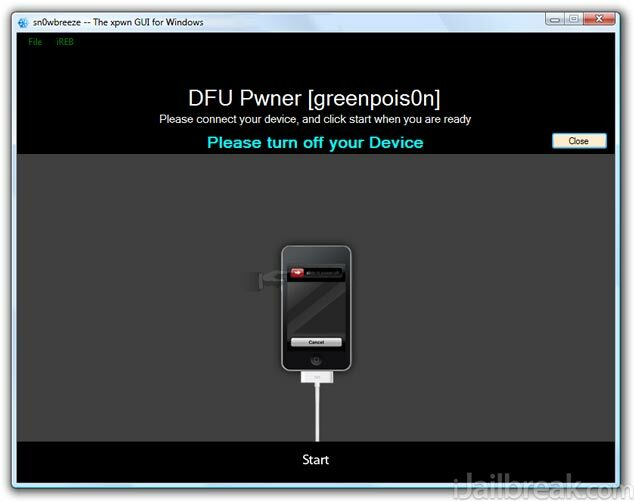 Step 12) – After Sn0wbreeze has created your custom IPSW you need to put your iDevice into DFU mode. To start this process click the OK button. When you click the OK button you will simply need to follow Sn0wbreeze’s real-time DFU mode instructions. Once you do this, your iDevice will be in DFU mode and you can restore your custom IPSW firmware file. Step 13) – After following Sn0wbreeze’s real-time instructions EXACTLY as shown, iTunes should launch you will be prompt by Sn0wbreeze saying iReb is successfully running, you can go back to iTunes and SHIFT click the restore button. Once you have done this you can now select your custom IPSW firmware file (located on your desktop) to restore to your iPhone or iPod Touch. Once your device has been successfully restored and it reboots, you should notice Cydia on the home screen. This means the Jailbreak was indeed successful. Congratulations! You now have an Untethered iPhone 4, iPhone 3GS or iPod Touch 4G on iOS 6.0, 6.0.1 or 6.1. Let us know if you have any additional thoughts or need help in the comments section below. ummm i restored but no cydia??!?! Hi, i made everything right, without errors and stuff like that, everything was fine, till I installed ultrasn0w, with signal everything is okey, but my messages really fck up.. no matter who send a messages for me, my iphone 3gs showing like new message ‘unknown’ when i open it there is no text just empty “text cloud”. and itunes don’t find my iphone 3gs.. any ideas? this jailbreak problem or ultrasn0w? actually my iphone can’t be found on my computer like a storage device.. but charging function working properly strange.. I just did, still doesn’t work.. Mine as well, itunes doesn’t recognize my device..
ultrasn0w still can’t be use in ios 6.1.
then how come posts like this makes it appear to be? I just got word on twitter that it is compatible.. Somewhere sometime something must’ve went wrong..